Town Tip Thursday: Attention homeowners! Town Tip Thursday, A WHAT MATTERS Initiative. Attention Homeowners – Get appropriate Building Permits and learn about a 2.99% Home Equity Loan that will help pay for them! In this week’s three minute tip, Beth Medved Waller encourages homeowners to make sure they obtain building permits as required for home improvements. She also discusses (with Katrina Meade) a home equity loan that City National Bank offers to help fund home improvements. The Building Code was adopted by the Commonwealth of Virginia to ensure the health, life and safety of its citizens. Certification by the County for compliance with the Building Code will assist in avoiding possible problems later. Building Permits are required for: New buildings, additions, decks, porches, detached residential accessory buildings larger than 200 square foot, attached or detached garages, above ground or in-ground pools, finishing a basement, interior alterations (removing walls, adding walls, enlarging windows), retaining walls, fences over six (6) feet, electrical work, mechanical improvements (including heat/ac) and plumbing work. If you are undertaking a project and are not sure if a permit is required, please contact our office at (540) 636-9973, prior to starting, and ask if a permit is necessary. *Beth’s note – be sure to call to check the building permit requirements even if you have a professional contractor making your repairs. As a Realtor, I’ve seen many situations when licensed contractors failed to get appropriate permits. Most all buyers have home inspections that will discover un-permitted improvements that may cause sales to fall through. City National bank can loan up to 89% of the equity in a primary residence. Their rate on this type of loan currently starts at 5.25% (for 80% equity) and it is tied to prime. There is currently a special first year rate of 2.99%. There are no closing costs with this loan except for the County’s recordation fee. The bank pays for the appraisal – if it doesn’t come in high enough, the client does not owe us anything. The Line has a 15 year draw period and a 15 year repayment period. During the first 15 years, the payment is interest only – minimum payment is accrued interest (any additional payment amount is a direct principal reduction). At the end of 15 years, the principal still owed is amortized out over the next 15 years. There is a $50 annual fee that is waived for the first year. Funds are drawn as needed and only they would pay interest only on the amount drawn. The interest may be tax deductible. Call Katrina Meade for more information at 540-631-3104 or email her at Katrina.Meade@bankatcity.com with any questions. Are you or your group in need of a free video that could be created to help market your cause or event? Visit www.whatmattersw2.com “Community” section to request a TOWN TIP or WHAT MATTERS WARREN BETHvid. Learn more Beth’s nonprofit, WHAT MATTERS, a 501 (c) (3), at www.whatmattersw2.com out the “Community” section to request a TOWN TIP or WHAT MATTERS WARREN BETHvid or contact her at 540-671-6145 or beth@whatmattersw2.com. This trip was Waller’s first trip to Uganda as a Rotarian. 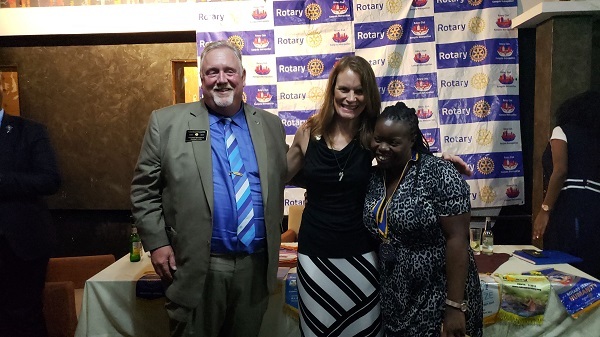 Though she only has been a member of the service organization for approximately one month, her trip to Africa with District 7570 Governor George Karnes (of the Warren County Rotary Club) enabled her to have already accumulated years worth of unforgettable Rotarian experiences. 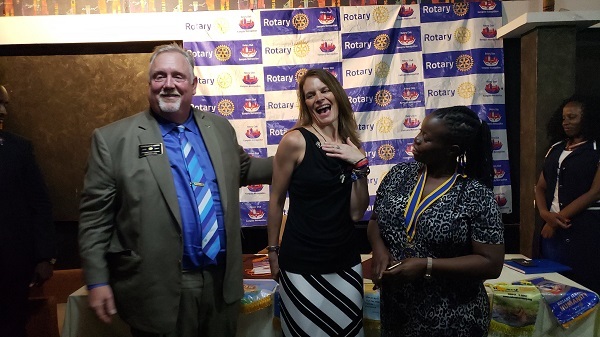 She was embraced beyond belief at meetings of The Rotary Club of Kampala Metropolitan and the Rotary Club of Mengo and met members from more than 20 clubs throughout the trip. During two meetings, she was invited to speak about her work with the Ugandan based non-profit she has partnered with since 2017, Light up Life Foundations. 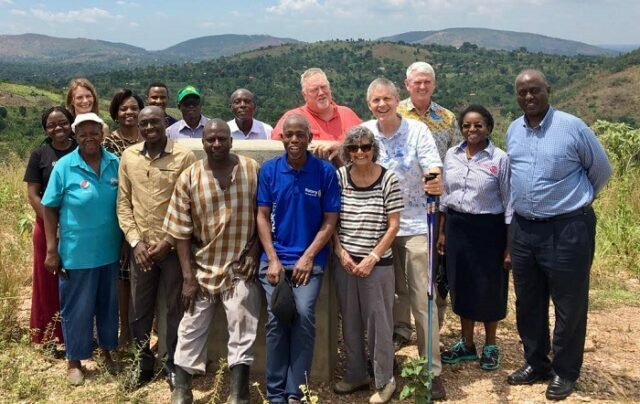 Additionally, the Warren County Rotarians attended a presentation by members of the Rotary Club of Kampala North at the development site of the future Sam Owori Rotary Vijana POA Village. The village is a vocational campus being constructed to train the next generation of Ugandans in green energy, computer technology, agriculture, plumbing, electrical skills and more. 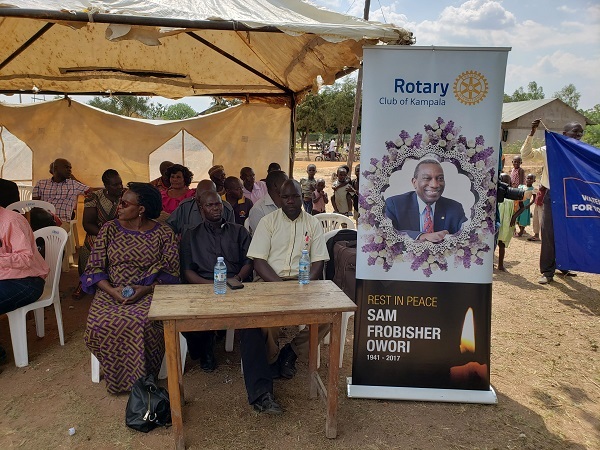 Waller and Karnes were also blessed to be able to attend the March 31st kickoff of the enormous “Sam F. Owori Memorial Water, Sanitation and Hygiene Project” in Tororo. The late Sam Owori (of the Rotary Club of Kampala) was an internationally renowned Rotarian who was to be Rotary International President this year (prior to his unexpected tragic death). When construction is complete, nearly 20,000 Ugandans will have a safe solar-powered municipal drinking water system and hygienic sanitation facilities. In addition, through the project nearly 40 individuals have been extensively trained to install micro-flush sanitation systems. “Benefits of the Micro-flush toilet are no smell, flies or mosquitoes. You build it once instead of every 2 years. The Micro-flush toilet is cheaper and better than a pit latrine,” according to Walter Hughes who was also on the ground in Uganda representing District 7570. Internationally beloved Rotarian Hughes spent time sharing with Beth helpful insight from his vast experience with dozens of successful service projects all over Africa. 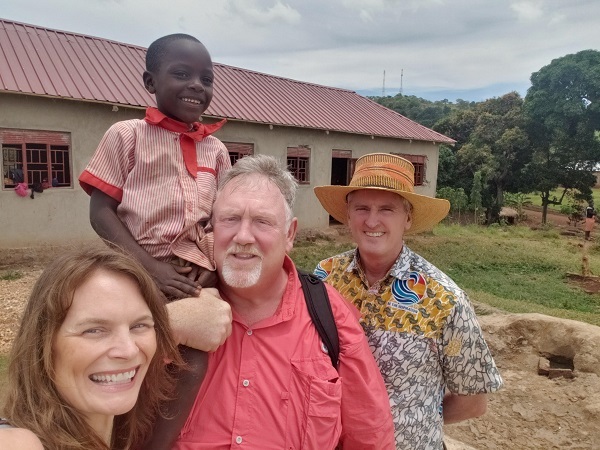 In March, Waller’s nonprofit, WHAT MATTERS, funded a pit latrine at the school she and Light up Life Foundation constructed in the remote village of Bunyade. Had she had Hughes advice along with the power of Rotarian wisdom behind her then, she would have instead installed a more affordable and more environmentally sound micro-flush system. As a part of the Owori Memorial Grant, one such toilet system has been installed adjacent to a maternity ward (where 50 children per month are brought into this world). A 1000 liter water tank will also be brought to the birthing facility that currently turns away women if they are not able to provide 200 liters of water prior to admission. When visiting the less than ideal medical facility, Waller noted a tattered paper sign taped to the wall that shares the Tororo District’s vision, “To have a healthy, productive and prosperous people living in a clean environment within 10 years.” The community is now many steps closer to fulfilling that dream thanks to Rotary International. 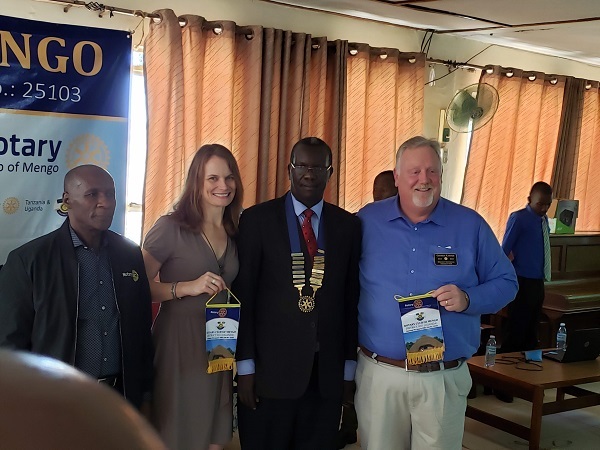 District Governor Karnes was the lead for the Tororo Owori Memorial Grant, a project which united the entire organization and nearly every continent in the world by raising more than $228,000. George and Rotarian James Serugo (of the Rotary Club of Kampala) worked tirelessly on this project that was identified in 2016 and has involved more than 48 Rotary Districts across the world (and over 60 clubs), ranking as the largest singular international grant to date. Norah Owori, in her comments at the kickoff ceremony in Merekit on Sunday, March 31st, eloquently shared, “I’m very grateful for the Rotarians from around the world because they have given the people of Merekit a new relief of life. I’m especially grateful to DG George (Karnes) and Rotarian (Walter Hughes).This project was promised to my late husband by his Rotary friends when he was elevated to Rotary International President Elect. The fact that you worked so hard and made this project a reality even after Sam has passed on is a great testimony to Rotary’s service to humanity.” Waller and Karnes were kindly included in a lovely intimate breakfast and a community lunch hosted by Mrs. Owori at her home. They were also fortunate to have been able to pay their respects at the graveside of Sam Owori and attended a beautiful service at the Owori family church. Waller met countless friendly and inspirational Rotarians and was hosted in the home of esteemed Rotarian Sarah Odongo, of the Rotary Club of Kampala, who has pledged to be a mentor in Beth’s Rotarian work as Sarah has served in many Ugandan and Rotary International leadership capacities. Rotarian Emmanuel Sabiti of the Rotary Club of Bunga, has kindly offered to help Beth find Light up Life Foundations a new location for the Maisha Home for Children (since they were forced to vacate their prior rental). Many other kind Rotarians have expressed an interest in working with Beth and her club in future projects. Upon return to Virginia, Beth shared with fellow members of her club, “I feel as if we have truly become a part of a new international family of like-minded humanitarians. I’m looking forward to being able to make more of an impact in Uganda as a Rotarian and will be immediately working to identify a partner club in the Kampala area to start developing a Rotary International Grant to benefit the children I have grown to love there. The friendly Rotarian welcome I received in Uganda has also inspired me to help to coordinate a Friendship Exchange between District 7570 and District 9211 in the near future.” James Serugo (of the Rotary Club of Kampala) says of the Friendship Exchange Program, “Rotarians from one district visit Rotarians in another district to become friends and extend service through friendship to their communities.” Waller hopes that Rotarians and non-Rotarians alike interested in working her on Ugandan projects, or joining her on a future trip to Africa, will reach out to her through her Facebook page, Beth Medved Waller or beth@whatmattersw2.com. This is the third video of our talented area youth that I’ve been blessed to share this last week as the spring performance season fast approaches. I’ve been so inspired and impressed by the gifted students and their dedicated teachers who touch the lives of our youth! “Break a leg” to the dedicated kids performing at area schools! This video highlights an upcoming performance of Disney’s “Aladdin Jr” at Front Royal Christian School. Front Royal, Virginia – Students at Front Royal Christian School will present Aladdin live on stage for three nights: April 11 at 6pm, April 12 at 7pm, and April 13 at 6pm at 80 N. Lake Ave., Front Royal, Virginia – the New Hope Church building. Tickets are on sale now at www.FrontRoyalChristianSchool.com and at a reduced rate for a limited time only. Thirty-six students are participating in this year’s Aladdin performance as actors, singers, and dancers. Students have attended sessions in voice and choreography, as well as nightly rehearsals to prepare for this production. In addition, there are students trained and participating in make-up, lighting, sound, and stage management. The cast will be present this Saturday at C&C Frozen Treats on Main Street, Front Royal from 1:00pm – 2:30pm and Rural King Supply Royal Plaza Shopping Center from 3:00pm – 4:00pm. Princess Jasmine, Aladdin, Genie, Magic Carpet, and more characters will be dressed in costume and make-up and available for photographs. This will be a great opportunity for children to meet their favorite Aladdin character. Front Royal Christian School is a Pre-K through 12th grade school in Front Royal, Virginia, that fosters your student’s innate learning potential. From special needs to gifted, FRCS is committed to the spiritual, moral, and intellectual development of its students and mediates a sense of competence, confidence, and belonging. FRCS provides the 21stcentury learner, exceptional and challenging educational experiences, including college preparatory courses with a dual enrollment program with LFCC, performing arts, life skills, and athletics. For more information, call the school at 540-635-6799 or visit www.FrontRoyalChristianSchool.com. Learn more Beth’s nonprofit, WHAT MATTERS, a 501 (c) (3), at www.whatmattersw2.com – check out the “Community” section to request a TOWN TIP or WHAT MATTERS WARREN BETHvid or contact her at 540-671-6145 or beth@whatmattersw2.com. WHAT MATTERS is a 501(c)(3) that focuses on local and global outreach to help spread the word, support and raise funds for causes that matter (primarily through Facebook). WHAT MATTERS has ZERO overhead as 100% of the expenses are funded by Beth’s real estate business thanks to her clients and supporters. Every cent raised goes to the cause she’s promoting and most are matched by Beth. If you’d like to get involved, or travel to Africa with her on a future trip to work with the children of Light up Life Foundations, please visit www.whatmattersw2.com. An interview with the cast of “Freaky Friday,” the Warren County High School musical performance coming up this week on Thursday, Friday and Saturday at 6:30pm! 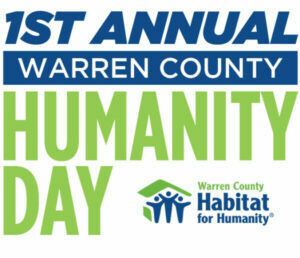 Don’t miss your opportunity to be entertained and inspired by the talent, teamwork and enthusiasm of our acting and singing youth in Warren County! A special thanks to all the adults who are leading these amazing kids and all those supporting them in this experience. From Director, Chris Whitney: Warren County High School’s Maroon Masques present the brand new musical ‘Freaky Friday’. Based on Mary Rodgers 1972 comedic children’s novel, this story was made into three Disney films and now a new musical. 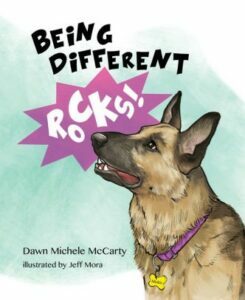 See what happens when a daughter and mother have to switch places and learn what it’s like to walk in each other shoes. This musical’s themes include relationships, family, loss, love, and empathy. It’s the perfect show for the whole family and the music will have you swaying in your seat. Performances are March 28th, 29th, and 30th at 6:30pm at Warren County High School. Tickets are $10 for adults and $7 for students and children, which can be purchased at the door. 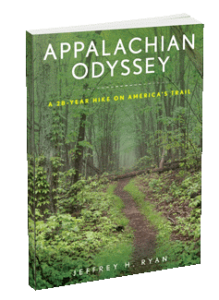 For more information, please email Cwhitney@wcps.k12.va.us. WHAT MATTERS Warren Interview – “Taste of Broadway” featuring 50 students from area middle schools to be held Thursday 4/4/19 at 6pm at WC Middle School. In this video Beth Medved Waller interviews Director, Todd Martin and singers Dillon Lewallen, Abby Knesh and Olivia Kelley. Todd Martin, Choral Director for both Warren County and Skyline Middle Schools, is pleased to announce a joint performance and fundraiser for both WCMS and SMS Choral Departments. An event called “Taste of Broadway” will be held at Warren County Middle School on Thursday, April 4th at 6pm. This event/fundraiser will include food (light hors d’oeuvres and desserts from local businesses will be provided), raffles and the beautiful singing of 50 students from both middle schools. “During our first school semester of 2018 we had a Talent Show at Warren County Middle School and it was a huge success. Shortly after, I had the idea to showcase the talents of both middle schools, given that I’m the choral director at both schools” said Mr. Martin, the proud director. Family, friends and the community are all invited to attend the program and hear fifty middle school students perform songs from favorite Broadway Shows. The evening will include songs from the Broadway musicals Annie, Wizard of Oz, Wicked, Sound of Music and more! “These students have put in over 50 hours of rehearsals to make this possible. Please come out to support the arts and local talent of our middle students in Warren County,” added Martin. Community ticket sales will begin on March 27th and can be purchased at the Warren County Middle School’s main office located at 522 Heritage Drive between the hours are from 7am to 3pm. Price per ticket for students is $10 and the adult price is $12. Seating is limited to 400 guests, and these performances tend to sell out, so be sure to get your tickets early for what should be a fantastic evening to witness and support the talents of local youth. Mr. Martin, the volunteers working with the program, the student performers and both school administrations thank the community for their support and hope this event will provide much needed funds to enhance the already dynamic choral departments at each school. Call WCMS at 540-635-2194 for more information or to find out how you can help support the arts in our community. Rotary District 7570’s Group Study Exchange Team began their adventures in Taiwan this week after a local send-off from area Rotary clubs. Meet the team in this video and read on to learn about the GSE program. To discover more about Virginia’s Rotary District 7570, please visit their website and follow the team’s trip by liking the team’s Facebook group page. You can also enjoy reports of their experience by following team member Tammy Yang’s vlog. The Team Leader is Beverly Pitzer of Martinsville Uptown Rotary. Beverly is eager to connect with the GSE team members and help to make this the best learning experience and leadership development experience possible for both the visiting team and for their hosts in Taiwan. She is prepared to generously share of time and knowledge of the Rotary projects in her area that may be of service to their hosts in Taiwan, and she is hoping to learn and bring back ideas and best practices from their hosts’ home projects. In her role as Community Reinvestment Act (CRA) & Fair Lending Officer at Carter Bank & Trust in Martinsville, Virginia, Beverly focuses her time and energy on understanding the communities’ needs across the bank’s footprint in Virginia and North Carolina. With this understanding, Beverly collaborates with colleagues at the bank on community development projects. These projects include: revitalization and stabilization, economic development, essential services, and affordable housing. This comes in the form of lending, donating, and serving in low and moderate income areas and distressed and under-served areas. In addition to Community Development, Beverly also focuses on Fair Lending, which is driven by the Fair Housing Act and the Equal Credit Opportunity Act. Her work in Fair Lending includes a proactive approach to lending, investing, and serving all communities fairly. Outside of her service and work in Rotary and Carter Bank & Trust, Beverly is involved in a number of other community organizations. She serves on the Board of Directors of the United Way of Henry County & Martinsville and is involved in the Community Impact Committee and Executive Committee. Beverly is active in the Bridges out of Poverty initiative in Martinsville/ Henry County/ Patrick County and is on the Implementation team for their first set of “Getting Ahead in a Just Getting by World” classes. Additionally, Beverly serves on the E3 Advisory Council, a project of the Department for Aging and Rehabilitative Services (DARS). Beverly is a member of Christ Episcopal Church in Martinsville, Virginia. Blaine Elliott is a charter member of the Blue Ridge New Generations Rotary Club in Roanoke, Virginia and currently serves on the district conference committee. He is excited to join the GSE team and help make this experience meaningful for both the team and hosts in Taiwan. Blaine is currently owner of CaZiWa LLC, a real estate investment firm. Blaine’s firm is focused on investing in single family homes in the Roanoke Valley and surrounding areas and improving the homes and neighborhoods by providing quality, affordable housing for a growing community of people with the desire to rent rather than own. CaZiWa also provides a platform for investors who wish to enter the real estate investment asset class passively. Outside of his service work with Rotary, Blaine is an active member of his church, First United Methodist Church in Salem, Virginia. He is a member of the Genesis Praise Band on the drums and involved with the youth as an adult leader helping with everything from mission trips to leading the Senior High Sunday School Class. Wendi Goods Everson serves as Senior Program Officer for Danville Regional Foundation (“DRF”), a private independent foundation whose mission is to revitalize the Dan River Region by making long term investments in economic development, education, health, and community capacity. At DRF, Everson focuses on community development and civic engagement. Everson holds a bachelor′s degree from Temple University, an MBA from Averett University, and a certificate in nonprofit management from Duke University. She is a Southeastern Council on Foundation Hull Fellow and graduate of the Chamber of Commerce Leadership Southside. She serves as a board member of River District Association and CIC Head Start. Everson is the 2014 recipient of the Danville Pittsylvania County Chamber of Commerce Pace Award for Community Service. In her spare time, Wendi enjoys coaching youth basketball. She is the founder of the Virginia Owls youth basketball program where she mentors young athletes aspiring to play sports at the college level. Wendi is married to Jason and they have 3 children: Jada, Jenesis and Wesley. Asia Malone is a member of the Rotary Club of Bristol Virginia-Tennessee. She serves on the Public Relations Committee and as Co-Chair of the Rotaract Committee. Asia is the Chief of Staff for the Boys & Girls Clubs of the Mountain Empire. She handles the day-to-day management of personnel and insures all staff issues are addressed properly. The Boys & Girls Club is an after-school program that provides life enhancing opportunities for children and teenagers who may not have access to life developing resources. Outside of her service/work in Rotary and The Boys & Girls Club, Asia is involved in several community organizations. She serves on the United Way of Southwest Virginia Early Childhood Success Council, is an active Reading Buddy for the Reading Buddies Bristol Tennessee/Virginia, and serves on the Martin Luther King Jr. Celebration Committee. Asia is a member of New Hope Baptist Church. Tammy Yang serves as the general manager of Sake House Japanese Restaurant located in Blacksburg, Virginia. Though she has many roles, her main focus is becoming a community icon for their establishment. Yang is currently a member of the South Main Merchants Association in Blacksburg. She also serves in the Blacksburg Junior Women’s Club (BJWC). Yang is sponsored by the Montgomery County Rotary Club. As a Taiwanese American, she is eager to learn more of her family’s origins on the GSE trip to Taiwan. She is also hoping to view how other businesses provide different interactions with their community by building lasting connections and strong networks. By viewing their examples of collaborating with other businesses to help better their community, she can learn about different business models and opportunities that can be implemented in her community. The Group Study Exchange (GSE) program is a unique cultural and vocational exchange opportunity for young business and professional men and women in their initial years of professional life. Rotary districts in different countries are paired to send and receive professional study groups of four to six non-Rotarian team members and one Rotarian team leader to travel for four to six weeks, staying in the homes of Rotarians when possible. Launched in 1965, this dynamic program has built a successful track record at the personal, community, and international level. With good planning, a goal-driven itinerary, and active participation of dedicated Rotarians, a GSE can be an exceptional educational experience for both the visiting GSE team and local Rotarians. The GSE program is designed to develop professional and leadership skills among young adults, so that they can address the needs of their communities and an increasingly global workplace. GSE participants follow an extensive and rigorous program of international travel and team activities. WHAT MATTERS is a 501(c)(3) that she started this year to enable people to have the benefit of a tax deduction for their donations through her fundraising matches. Here is the Current Match Campaign for the children of Bunyade school project (in Uganda, Africa). WHAT MATTERS has ZERO overhead as 100% of the expenses are funded by her real estate business (THANK YOU CLIENTS AND SUPPORTERS for making that possible!). Every cent donated goes to the cause. Beth focuses her support on local and global outreach to help spread the word, support and raise funds for causes that matter. If you’d like to get involved, or travel to Uganda with her on a future trip to work with the children of Light up Life Foundations, please visit www.whatmattersw2.com. 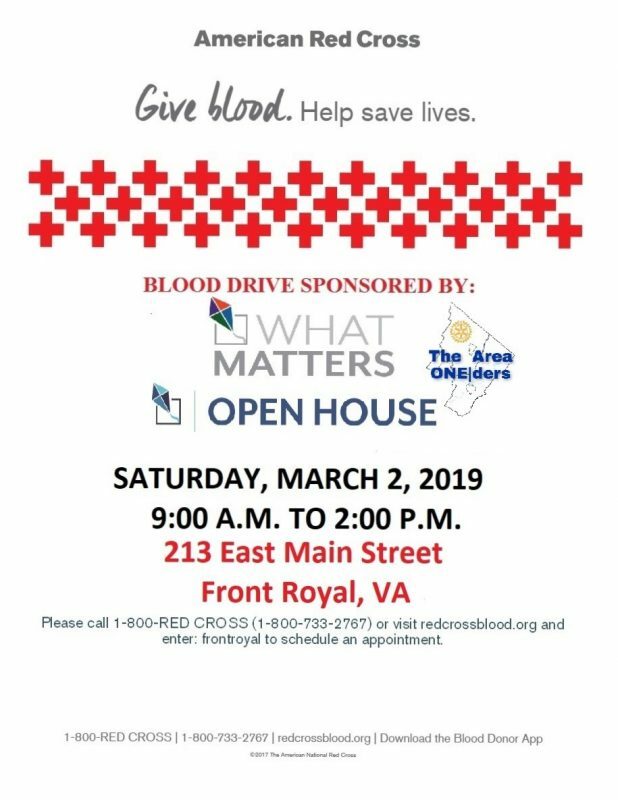 WHAT MATTERS will be sponsoring an American Red Cross blood drive for the community on Saturday, March 2, 2019, on Main Street in historic downtown Front Royal. Members from The Area ONE|ders, a new Rotary Club forming in the region, will be showing their support. “As a soon to be new Rotary club in the region, we are eager to begin our commitment to Rotary’s Five Avenues of Service. This WHAT MATTERS initiative is a great opportunity for our involvement in Club and Community Service,” said Doug Sexton, who will be President of the new club. The drive will be held from 9am-2pm at OPEN HOUSE, the WHAT MATTERS community meeting space. Located directly beside the Daily Grind coffee shop, OPEN HOUSE is in the Middle of Main building at 213 E. Main Street. Blood is routinely transfused to patients with cancer and other diseases, premature babies, organ transplant recipients and trauma victims, according to the Red Cross. “The short amount of time it takes to donate can mean a lifetime to a patient with a serious medical condition. We hope that our community will join us in this remarkably easy way to truly give the gift of life this weekend,” shared Beth Medved Waller, who is President Elect of The Area ONE|ders and Founder of WHAT MATTERS. Convenient parking can be found in Waller’s real estate office parking lot at 27 Cloud Street (located adjacent to the street directly behind the Middle of Main building) or along Main Street. 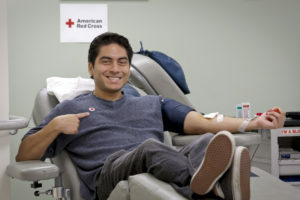 For information about eligibility or to schedule an appointment, please contact the Red Cross at 1-800 RED-CROSS or visit www.redcrossblood.org. Walk-ins on the day of the event are welcome, but donors can save time by registering prior to the drive and are now able to speed up the process by filling out the health history questions online.